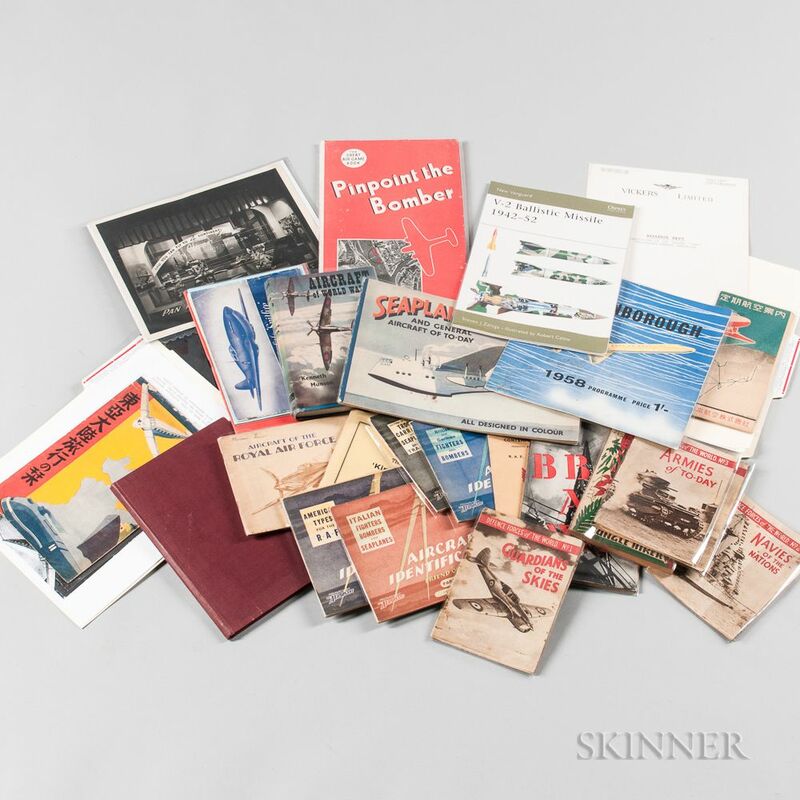 Group of Aviation Ephemera, England and United States, mid-20th century, includes Aircraft Identification Parts 1-4; a complete Kingston Cigarette Picture-Card album; complete Player Aircraft of the Royal Air Force; Aircraft of World War II; The Book of Spitfire Warplanes No. 3; The War in the Air: Fighters of the Present War; Camouflage of 1939-42 Aircraft; Seaplanes and General Aircraft of Today; program for the 1958 Farnborough Air Show; Defence Forces of the World Nos. 1-4; BBC at War; Pinpoint the Bomber Game Book; National Opinion Research Center War and Peace 1943 Edition; The Jungle Hiker; Goodwill Exhibition of Contemporary Art catalog; V-2 Ballistic Missile 1942-52; Vickers Limited Particulars of the Vickers' "Vimy" Two-Engined Bombing Aeroplane; 1934 photo of a Pan Am World Airways Travel Agent window display; 1938-39 Japan Airlines timetable; and 1939 Mitsukoshi Travel Event.